If you’re like me, you work the standard grind of Monday through Friday from 8 A.M. to 5 P.M., sitting at a desk. You squeeze in a class as many days as you can to keep up with your practice, and truly feel the benefits of your dedication. You constantly struggle to undo the damage to your hips and shoulders from sitting all day, and at the end of each class you feel renewed. 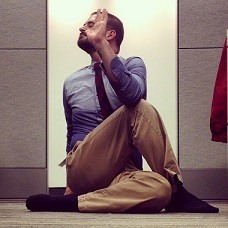 In my novice experience, no class does a better job of offering this feeling than a Friday night yoga class. For most of us, Friday is the time to let loose. We’ve spent all week at our second home (the office), eager to let loose and do what we want as soon as 5 P.M. strikes. I am not this person. To me, Friday begins my time to prepare for the upcoming week. If I set the right intention on a Friday night, it will dictate how successful my weekend will be. I achieve this through an hour-and-a-half Vinyasa class. All week I look forward to this class. Why? Because it is hard! Exactly what you want on a Friday night, right? Right! Here are six reasons to attend a yoga class on Friday night. 1. The week ends on your terms. Yoga is an individual journey. Regardless of if you have a supportive community, are in a class, or attend with friends, once practice begins, it is just you and your mat. What better way to complete the week than by having a dialogue with your inner self? 2. You’ve already given up. Friday is considered the lost day. It’s where the least amount of work gets done and where we already settle into a potential habit of laziness. Why not set a different tone and reclaim that which is yours? 3. You will want to give up. Taking an intense Friday night class will push you in your practice. You will realize that it is hard and you may want to give up. When that happens, turn towards your inner self and push that much harder, or pause in Balasana, return to Ujjayi, and resume the posture. You will feel the rewards of conquering the ego, your fears, and your doubts. 4. You will have something to look forward to. Having a consistent Friday night practice really sets the tone for a day. You can transform that “lost day” into one of wonder. Knowing you are going to embark on a challenging, rewarding journey later that evening can make all the difference in how you plan and spend your Friday. 5. You can receive proper adjustments. The difference between muscling into asana and easing into it via a well-executed adjustment can be powerful. Even though in group classes adjustments aren’t given as frequently as some of us might like, the opportunity remains present. Practicing at home doesn’t always provide the luxury of additional arms to open us up more, or extra feet to keep us planted. 6. There’s no better way to begin a weekend than in Savasana. You’ve worked hard all week. Continue to work hard just a few hours beyond that final departure bell, and you will earn your reward. It’s not money or another vacation day; it’s that moment of presence we practitioners are always striving to achieve. Entering Savasana after an arduous class, especially following a tough week, can be healing in so many ways. I encourage you to skip the happy hour this Friday and reconnect with you. Taking the time to work through the stress of the week on your mat, surrendering to another’s routine, offers solace in your practice. Embrace the difficulty of making a Friday evening class the labor your body deserves. by Andrew Harris - Andrew came to yoga after a spinal injury in 2005. Drawn to the myriad benefits of yoga practice, Andrew uses his cheeky attitude and fun disposition to share the eight limbs in an informed and playful manner. Forever a student, Andrew is pursuing teacher training to deepen his practice.